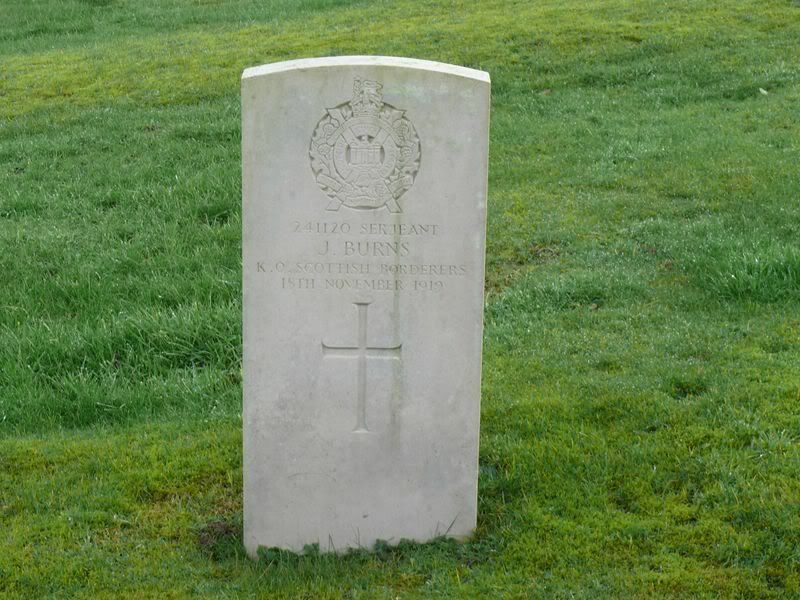 JAMES BURNS – age 54 – Sergeant (241120) 4th Battalion, King's Own Scottish Borderers. James enlisted in June 1915 but did not serve overseas and was discharged due to sickness in April 1918. He was awarded a Silver War Badge (403787). James died of cancer at Castle Douglas Hospital. Husband of Eliza Jane Sheals of Carlingwark Street, Castle Douglas, later Mrs Riley of Rhonehouse, Castle Douglas. Died – 15 November 1919. ROBERT MURRAY BYERS – age 39 – Private (M2/183181) 621st Company, Army Service Corps. Robert previously served for two years with the Hampshire Yeomanry in the Boer War. 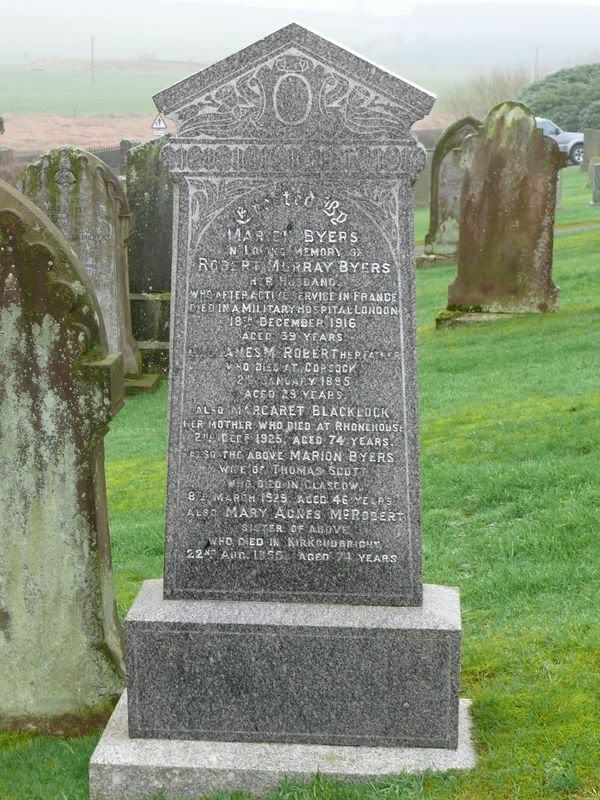 He was employed at Hollybush House near Ayr when he enlisted in December 1915. He was mobilised in June 1916 and served in France where his unit was attached to a South African Siege Battery. In October 1916 his car was blown into the air by a shell and he was evacuated to hospital in England. It had been decided to discharge Robert from the army with effect from 1 January 1917 and he was awarded a Silver War Badge (95331) but he died of shell shock in the Banstead Hospital, near Epsom in Surrey. Born 1877 at Knockwalloch, Kirkpatrick Durham, Kirkcudbrightshire – as Robert Murray. Son of Margaret Murray. Husband of Marion (McRobert) Byers who he married (as Robert Byers, a Coachman at Roebuck Castle, Co. Dublin) in 1903 at Maryhill, Glasgow. Died on Service on 18 December 1916. "who died after five years active service"
JAMES LIVINGSTON – age 23 – Corporal (M2/101504) Royal Army Service Corps. James was a chauffeur when he enlisted in May 1915. He served on Western Front in the 8th General Headquarters Army Service Corps (MT) and died of pneumonia in the Castle Douglas Hospital. Born 1897 at Castle Douglas, Kelton Parish. 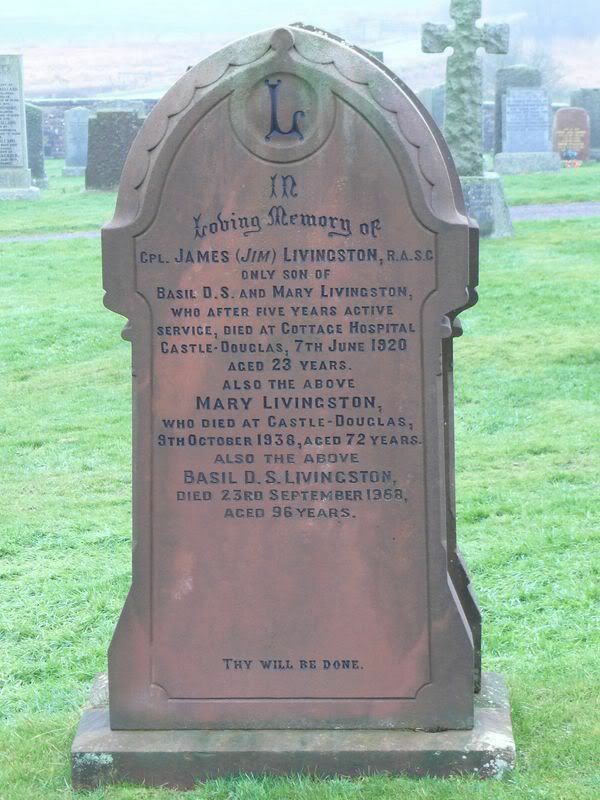 Son of Basil Douglas Shennan Livingston and of Mary (McKie) Livingston of 55 Queen Street, Castle Douglas. Died – 7 June 1920.